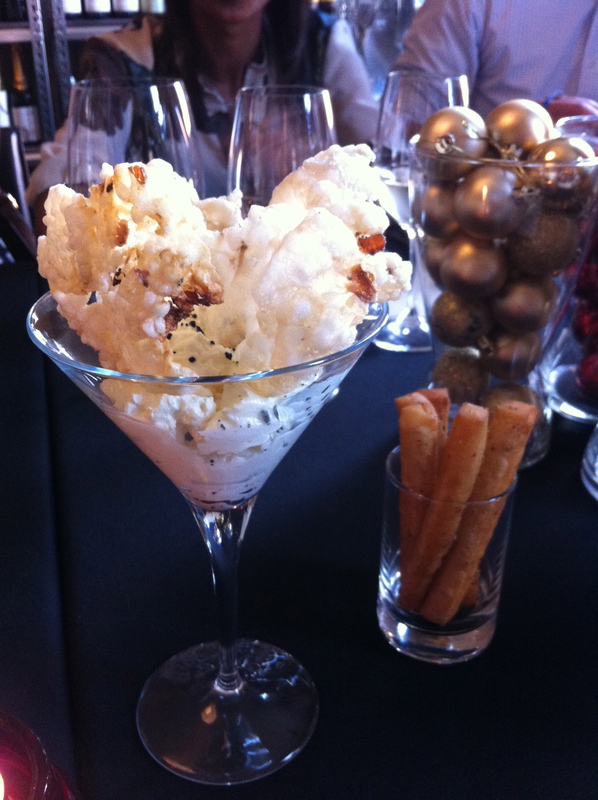 Estelle Restaurant & Bar… great new dining experience! | 15,000kms of Food! 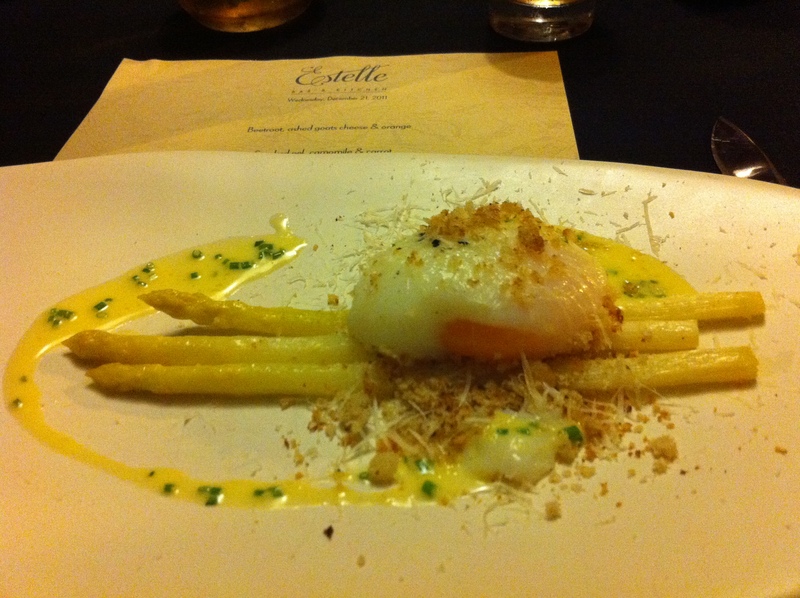 Estelle Restaurant & Bar… great new dining experience! Wow, it’s been ages since I’ve been so thrilled by a restaurant. 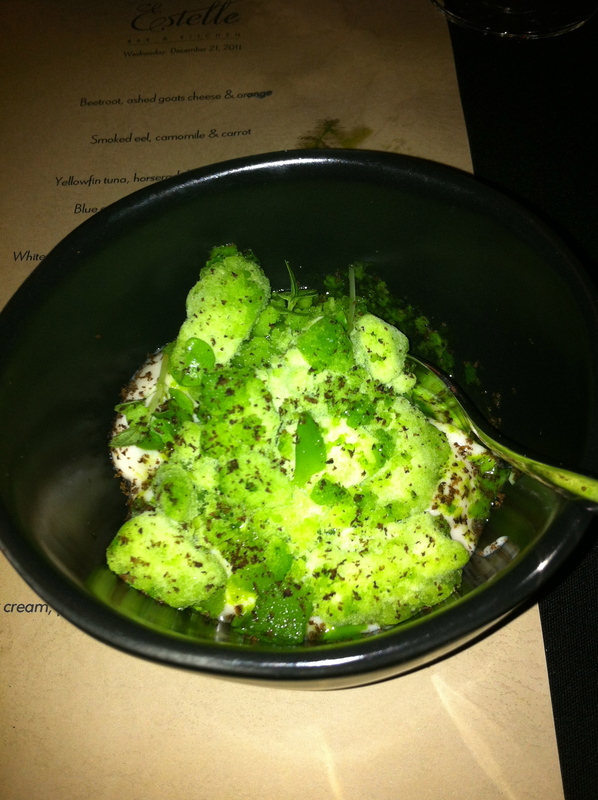 I’d heard good things about Estelle Bar & Kitchen prior to going but the dinner itself was spectacular! I was there for a friend’s birthday dinner which started out in the sunny courtyard for a few drinks then up to the private dining room. Prior to the degustation starting, we were given little snacks… I don’t quite remember exactly what they were but they were very good, especially the little sticks (bottom right of the photo below). 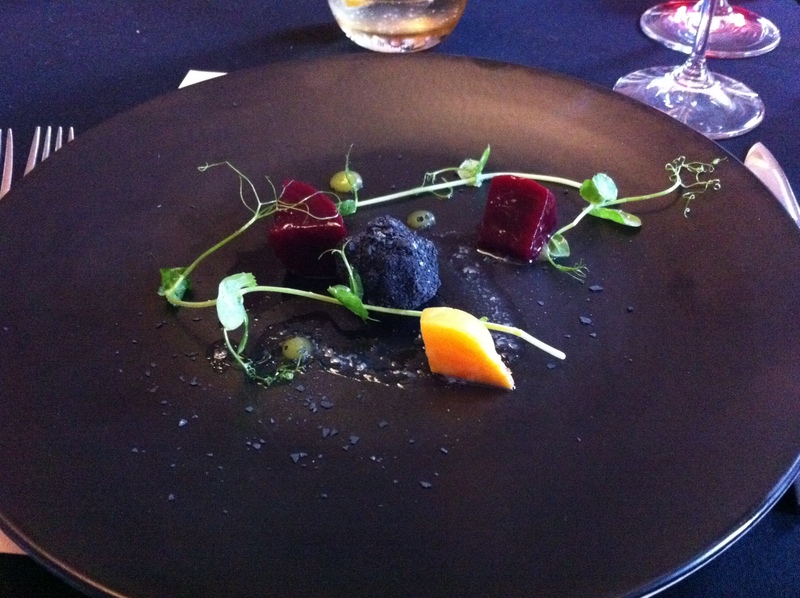 Dish 1: Beetroot, ashed goats cheese & orange. A light start to the meal, well balanced and tasty. Dish 2: Smoked eel, camomile & carrot. 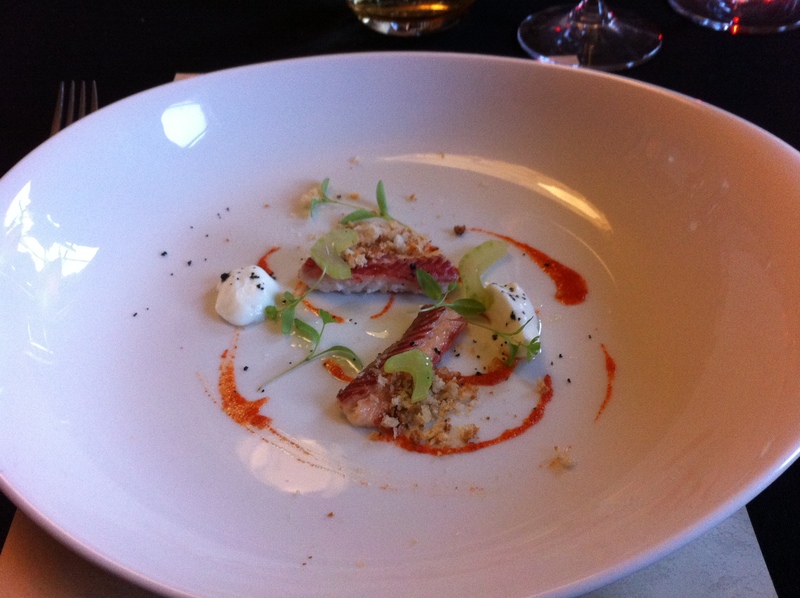 The eel was delicately smoky and offset with the light camomile cream. 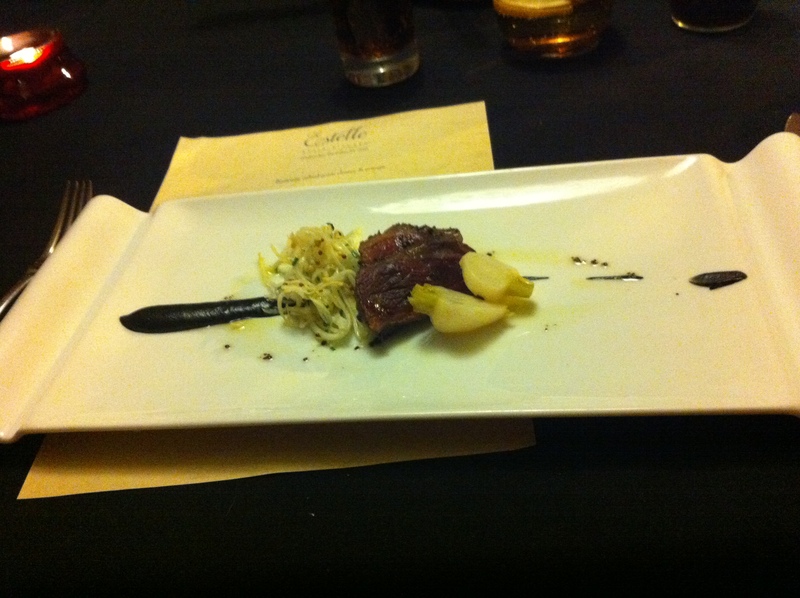 Dish 3: Yellowfin tuna, horseradish & red cabbage, or blue eye bakala, fennel & lemon. 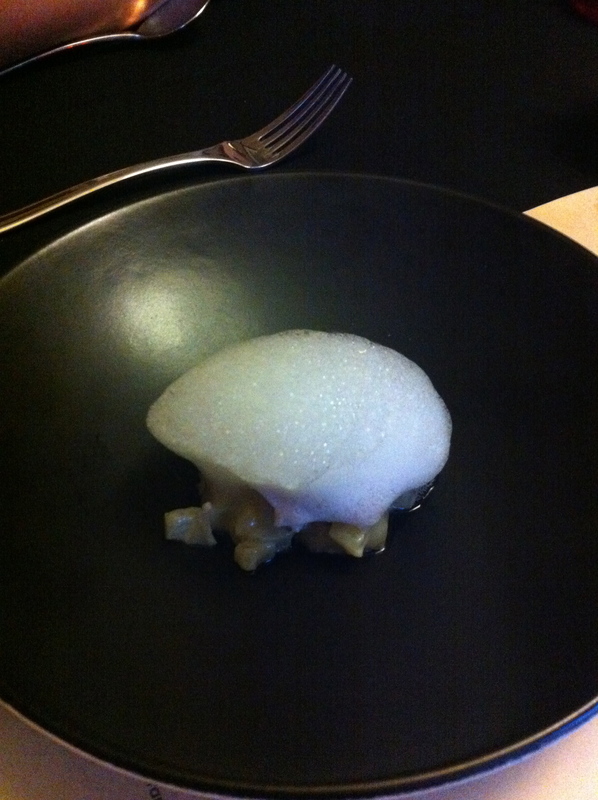 The tuna was superb – it was coated in what seemed like mini rice crispies which had a wonderful texture. The blue eye was salted and had a great tangy lemony flavour. My understanding of “bakala” is that it is a Portugese way of salting fish. 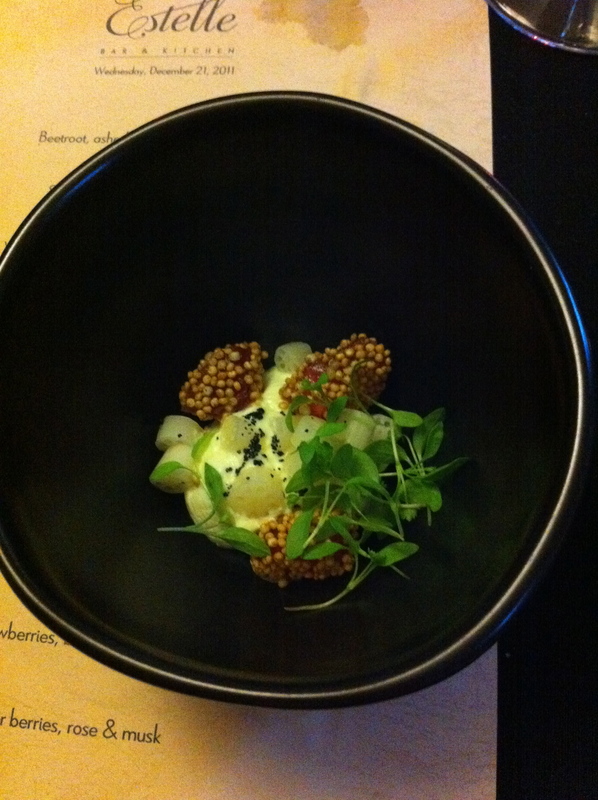 Dish 4: White asparagus, 63 degree egg & brioche crumbs. Most of you would know that I don’t eat eggs, so I had a different version of this dish was which topped with a cauliflower sausage (I initially thought it was silky tofu). 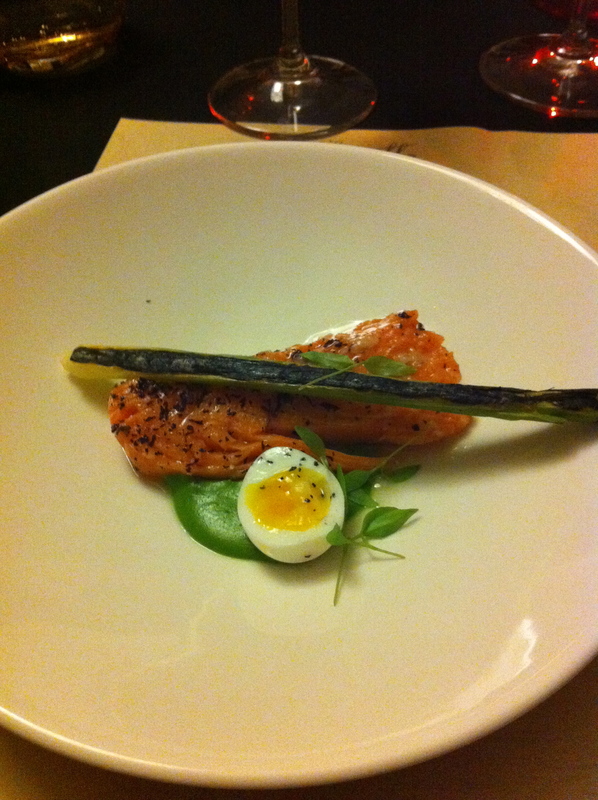 Dish 5: King salmon, peas, mint and purple shiso. Fish was perfectly cooked, flavours were in harmony. A fantastic dish. 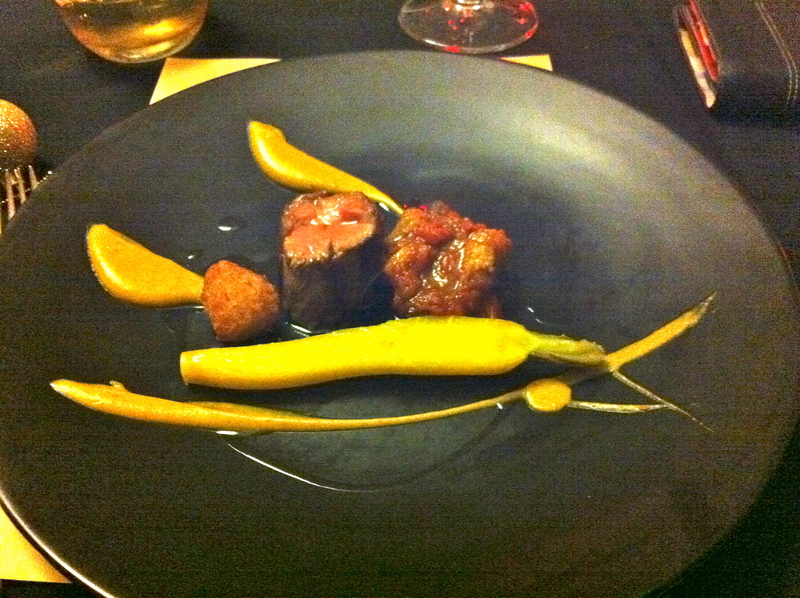 Dish 6: A taste of new season’s lamb, or saddle of kangaroo, celeriac & baby turnips. The token meat dish both were cooked superbly and with lovely accompanying vegetables. Dish 7: Strawberries, basil & vanilla. Lovely icy dessert to ease us into the sweets. Dish 8: Summer berries, rose & musk. I love this dessert. It looks beautiful and it tasted fresh and summery. 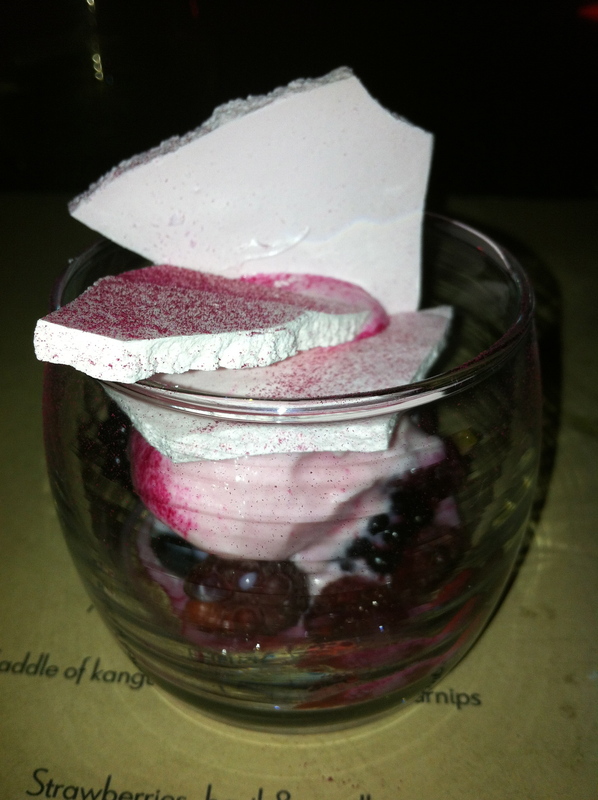 The chips of rose and musk atop a berry ice cream and fresh berries – yum! 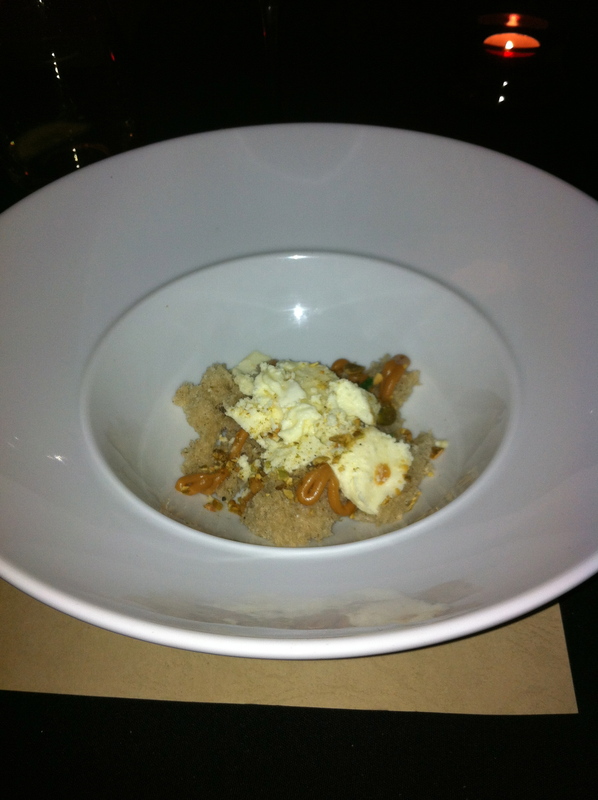 Dish 9: Sour cream, pumpkin & salted caramel. Soft pieces of cake topped with sour cream and pumpkin and caramel sauce – it was a nice way to end the dinner. These words describe my overall experience of Estelle: delicate, enchanting, and well balanced. This is a great dining experience, and at a very reasonable price for the quality of food. Get in there before it gets too popular! Previous PostMovida Aqui… Yummy Spanish Food!Next PostBarbuto… amazing roast chicken! wow, this is in my neighbourhood … look amazing. Bacala` is both dried salted cod in Italy or bacalhau in Portugal. Pingback: The Commoner… not so common! « 15,000kms of Food!